Most-liked photo of all time: How photojournalist Scout Tufankjian snapped that shot of Barack hugging Michelle. Photojournalist Scout Tufankjian has been chronicling the political career of Barack Obama on and off since 2007. During the 2008 campaign, she worked as a journalist for various outlets and shot a book’s worth of photographs. This time around, she was hired by the campaign itself, coming on board in August 2012 as one of two photojournalists on Obama’s campaign team. 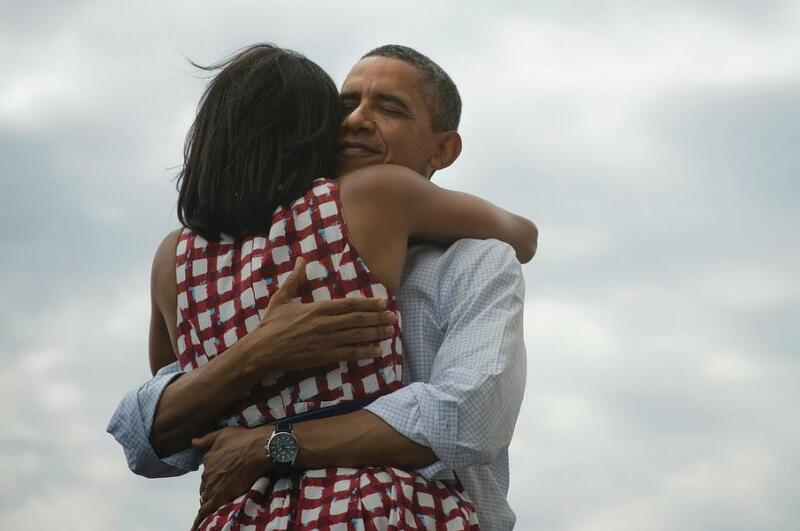 Her image of the president hugging his wife went viral on Tuesday night when the campaign tweeted it—along with the phrase “Four more years”—after news came that he’d won re-election. The post went on to become the most retweeted in Twitter history, and the image quickly became Facebook’s most-liked ever. Tufankjian spoke with Behold about the photograph, how and when she snapped it, and what she’s enjoyed most about covering the campaign. The interview has been edited and condensed. Slate: How’d you get that shot? S.T. : It was taken back in August, on the third day of an Iowa bus tour. So super old-school. It was a 2007- 2008-style Iowa bus tour, and I think it was nostalgic for the president. It was the first day that the first lady had joined us so he hadn’t seen her in a couple of days. She came in on a bus that morning—it was the first event of the day—and they embraced on stage. Slate: That was his first time seeing her? S.T. : Onstage in front of all those people. I decided to focus on them rather than taking a wider shot, because I think I’m not alone in finding their relationship to be totally aspirational. The obvious love and respect that they have for each other, and that the relationship is clearly one of equals, despite the fact that he’s the president, is remarkable. So I wanted to focus on them as a couple rather than on them and the crowd, or them and their position. Slate: Did you know the campaign was planning to use the image in its victory tweet? S.T. : No, I had no idea. I found out when a friend of mine e-mailed me to let me know that they had used it. Slate: How did you feel when you heard? S.T. : I was extremely excited. I don’t kid myself that the popularity is about the image itself. It’s about the message and how people feel about the Obamas and especially how people feel about the Obamas in that moment. It’s not the composition or anything. Slate: It’s interesting that the campaign chose an image of the two of them in such a private moment to celebrate such a public thing. S.T. : I actually quite like it. It reflects on the way that people feel about the Obamas as people, rather than as public figures. The wonderful thing about working for the campaign is not being with the president or on Air Force One or any of the things that would happen covering any president’s campaign. Spending time with that family is the thing that’s so wonderful. What the family is and represents to the country is as much a part of the president’s appeal as his policies. I don’t know why they chose it, but that’s why I like the choice. As opposed to him waving in front of a flag or something more traditionally presidential. Slate: What’s it like to shoot Obama with his family? Slate: How is their relationship aspirational? S.T. : Well, I’m young and I’m in a new marriage. The way that they relate to each other—they just celebrated their 20th anniversary–the way they enjoy each other and listen to each other, and the real respect that they have for each other is something I would like to see in my relationship twenty years from now. Slate: How did you feel when you saw the Economist cover using a similar image, along with the headline “Now, Hug a Republican”? S.T. : I haven’t seen it! I have not had a chance to leave this office. Slate: When you shot the hug, back in August, did you have any sense that you had gotten something special? S.T. : Any interaction between the two of them is always going to be the best stuff that I shoot in any given day, almost without exception. So yes, I guess. Slate: What is the process like, shooting for the campaign? Do you give them everything? Do an edit? S.T. : I do an edit for the campaign, and they push some of it out and keep some for later. We use the pictures on Facebook, on Twitter, but everything gets kept. But I did the initial edit, probably sitting in the back of a van on the way to or from an airport, trying to get an Internet signal in Iowa, which is near impossible. There were a couple of similars to that image, but that was the one I chose. Slate: This will probably become the most iconic image you shot during this campaign. Before it was released on Tuesday night, were there other shots you thought would be your lasting images from 2012? S.T. : There was the bear hug in Florida [taken when Obama was embraced and lifted off the floor by pizza shop owner Scott Van Duzer]. The bear hug, that was like one of these perfect moments: You’re standing in the right place, you have exactly the right lens, and you frame it perfectly. Everything just worked out. It was so shocking that I gasped out loud—I think you can hear me on the video—when he picked up the president. Afterwards we were all walking around in a daze, just like “He picked up the president.” The president’s response was kind of amazing. If someone had picked me up I would have made a shocked face. He just shrugged his shoulders and looked at the head of his secret service detail. 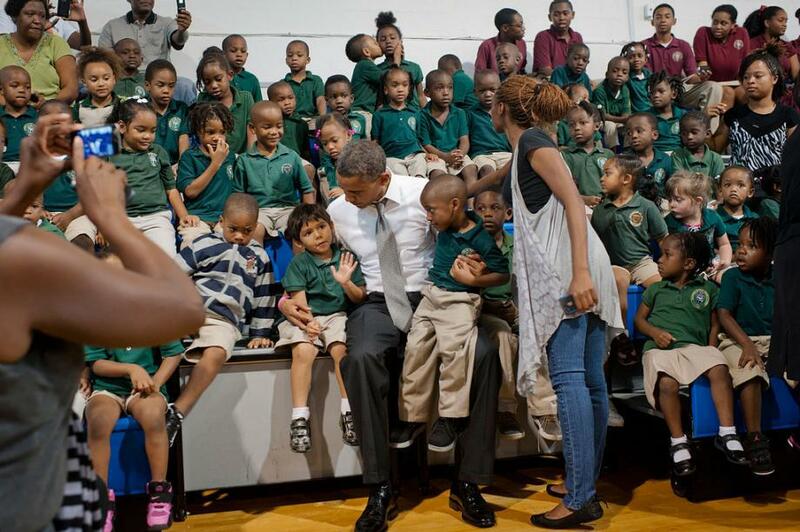 And there is also a picture from Florida, of the president speaking with school children, and two in the back row are kissing. Slate: I’ve seen that. Did you know when you shot it that you’d captured the kissing kids? Updated with a disclosure: Julia Turner and Scout Tufankjian are old friends.